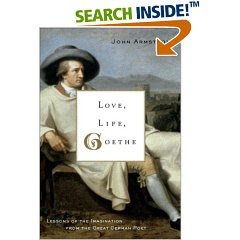 John Armstrong's "Love, Life, Goethe: Lessons of the Imagination from the Great German Poet" is now available. Goethe is more than just a 'Sturm und Drang' German writer. Much, much more. His philosophical, cultural, political and literary insights are necessary information not only to higher academics and theorists but any reading-interested individual. He wrote well because he historicized and contextualized well. "In working on this book I was surprised by how much I liked some of Goethe's works that I feared I would have to read merely from a sense of duty. In particular the plays Egmont and Tasso stuck me as really wonderful. I delayed reading Faust for as long as possible, finally getting round to it during a family winter holiday at a small coastal town..."
And reading Goethe is a life-changing experience. Whether it's the sufferings of Werther, or the torments of Faust and Gretchen, or Egmont's journey, Goethe can touch like very few can and have. And John Armstrong seems to have done justice to his predilection for context. Goethe's Italian journey.... is that code for something? It is code for experiencing more cultural and social freedom, pursuing things that bring personal and literary fulfillment, and embarcing the carnal, emotional, spiritual, cognitive aspects of the self. An Italian journey is an honest journey into the self..... Does this help?